LNG (Liqui­fied Nat­ur­al Gas) offers the pos­si­bil­i­ty to trans­port nat­ur­al gas by ship from pro­duc­er coun­tries all over the world to Ger­many. Many argu­ments sup­port the real­i­sa­tion of an LNG land­ing ter­mi­nal in Ger­many and espe­cial­ly in Wil­helmshaven. A land­ing ter­mi­nal con­tributes sig­nif­i­cant­ly to improv­ing the secu­ri­ty of sup­ply with nat­ur­al gas and the afford­abil­i­ty of a sus­tain­able ener­gy sup­ply for many decades. More­over, nat­ur­al gas makes an impor­tant con­tri­bu­tion to the reduc­tion of green­house gas emis­sions. LNG land­ing ter­mi­nals can be con­struct­ed either on land or as a float­ing unit. A float­ing ter­mi­nal – Float­ing Stor­age and Regasi­fi­ca­tion Unit FSRU – as planned for Wil­helmshaven, can be real­ized most eco­nom­i­cal­ly and quick­ly. Togeth­er with var­i­ous part­ners Uniper is work­ing inten­sive­ly on the real­i­sa­tion of the ter­mi­nal project in Wil­helmshaven. In 2018, Uniper began to mar­ket the capac­i­ty and to design the FSRU in detail. All nec­es­sary approval process­es have already been ini­ti­at­ed so that the LNG ter­mi­nal can be ready for oper­a­tion in the sec­ond half of 2022. LNG serves to diver­si­fy gas sources for the Euro­pean mar­kets and thus strength­ens the secu­ri­ty of gas sup­ply in Ger­many and Europe. Gas as a part­ner in the ener­gy tran­si­tion will con­tin­ue to play an impor­tant role in our ener­gy mix in the future: both in pow­er gen­er­a­tion as well as in the indus­try, in the heat­ing mar­ket and in the trans­port sec­tor. As nat­ur­al gas pro­duc­tion in Europe con­tin­ues to decline sig­nif­i­cant­ly, the need to import nat­ur­al gas will increase sig­nif­i­cant­ly in the com­ing decades. LNG will cov­er a sub­stan­tial part of this addi­tion­al import demand. For the ben­e­fit of the end con­sumer, addi­tion­al sources of sup­ply serve to strength­en price com­pe­ti­tion in the gas mar­kets. The devel­op­ment of an infra­struc­ture for liq­ue­fied nat­ur­al gas – LNG – with a land­ing ter­mi­nal in Wil­helmshaven will con­nect Ger­many much bet­ter to the glob­al gas mar­kets than before. This strength­ens com­pe­ti­tion between glob­al gas sources and is ben­e­fi­cial to the end con­sumer in Ger­many. The Ger­man government’s coali­tion agree­ment also con­tains the devel­op­ment of an LNG infra­struc­ture in Ger­many. FSRU pro­vides com­pet­i­tive access to the liq­uid gas mar­kets in North­west Europe to allow for devel­op­ment of liq­ue­fac­tion projects. Wil­helmshaven is Germany’s only deep water port and can be reached by LNG tankers of any size with­out tidal restric­tions. The loca­tion is close to the exist­ing pipeline and gas stor­age infra­struc­ture. The exist­ing infra­struc­ture and approvals will speed up the devel­op­ment of the project. The LNG tankers can berth in accor­dance with inter­na­tion­al stan­dards. Fur­ther­more, Wil­helmshaven is Germany’s only deep-water port. LNG tankers of all sizes can reach the facil­i­ty inde­pen­dent­ly of tides. In addi­tion, the ide­al mar­itime loca­tion allows LNG tankers to moor and dock with­out hin­der­ing traf­fic to oth­er major ports. There is an urban devel­op­ment agree­ment with the neigh­bour­ing munic­i­pal­i­ty of Wanger­land that enables indus­try and tourism to coex­ist. The required pipeline con­nec­tion to the near­by nat­ur­al gas pipeline Netra will main­ly cross agri­cul­tur­al land. The pre-con­di­tions for a lat­er land­side expan­sion of the ter­mi­nal for up to 40 bcm/a are already avail­able. The local econ­o­my will be strength­ened by the con­struc­tion of the ter­mi­nal and the accom­pa­ny­ing indus­try. The estab­lish­ment of an FSRU will allow Wil­helmshaven and the region of Fries­land to fos­ter its role as an ener­gy hub in North­west­ern Europe. FSRU – What is an FSRU? An FSRU is a float­ing stor­age facil­i­ty in which LNG, i.e. nat­ur­al gas, in its liqui­fied form, is con­vert­ed back to gas. After­wards the gas is fed into the grid and deliv­ered to the con­sumer. An FSRU allows Ger­many to be con­nect­ed to the LNG world mar­ket at sig­nif­i­cant­ly low­er costs than the con­struc­tion of an onshore ter­mi­nal. The FSRU tech­nol­o­gy is com­mon­ly used in the LNG indus­try. World­wide, more than 30 FSRUs are already in use and oth­ers are under con­struc­tion. The invest­ment costs for an FSRU are sig­nif­i­cant­ly low­er than those for the alter­na­tive con­cept of a land-based ter­mi­nal. Fur­ther­more, the time for imple­men­ta­tion is much short­er. The design of the FSRU in Wil­helmshaven offers the pos­si­bil­i­ty to use LNG as an envi­ron­men­tal­ly friend­ly fuel for ship­ping. The sup­ply of LNG fuelling sta­tions for heavy goods traf­fic is fore­seen by the planned facil­i­ty. The excel­lent infra­struc­tur­al con­nec­tion to the trans­port net­work also facil­i­tates the onward trans­port of LNG on land (e.g. for the trans­port of LNG to fill­ing sta­tions). The FSRU is designed to oper­ate for 20 years with­out dry-dock­ing. The FSRU will be per­ma­nent­ly moored to the jet­ty. 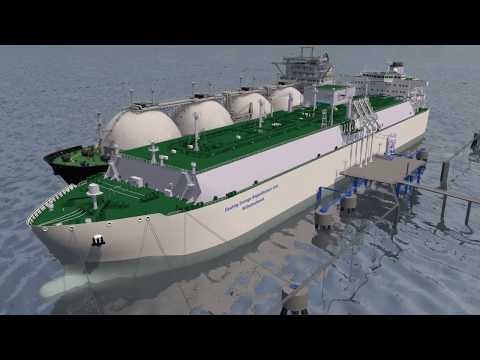 Flex­i­ble hoses con­nect the FSRU and sup­ply­ing LNG car­ri­er. The expect­ed load­ing rate will be 10,000 m³/h LNG. The dura­tion of the dis­charge oper­a­tion is sim­i­lar to the one of a land based LNG Ter­mi­nal. Regasi­fi­ca­tion will take place onboard, with sea­wa­ter as the source of heat. Nat­ur­al gas will be dis­charged from the FSRU via three dis­charge arms and then trans­port­ed to gas mea­sure­ment sta­tion using one pipeline. The FSRU will be able to load LNG onto bunker barges via the reg­u­lar man­i­folds as well as an addi­tion­al set of man­i­folds designed for the small­est barges aim­ing e.g. at inland water ways. Up to five truck load­ing bays are fore­seen to enable the onward trans­porta­tion of LNG via road or rail. Dis­cus­sions with inter­est­ed mar­ket par­tic­i­pants about the long-term book­ing of capac­i­ties at the ter­mi­nal progress well. With Mit­sui O.S.K. Lines (MOL), Uniper already has an expe­ri­enced and reli­able part­ner at its side. As part of the project, MOL intends to own, oper­ate and finance the FSRU. Why is Uniper engaged in the FSRU project Wilhelmshaven? Uniper is one of the largest gas com­pa­nies in Europe and has the tech­ni­cal and com­mer­cial exper­tise to imple­ment the project togeth­er with strong part­ners. Since more than 15 years Uniper is active in the LNG busi­ness. Uniper is well posi­tioned in Europe along the entire gas val­ue chain. There is no oth­er com­pa­ny in Ger­many that oper­ates at so many lev­els of the LNG val­ue chain. Uniper’s LNG port­fo­lio is on a steep growth track, with trans­port capac­i­ties and inter­na­tion­al LNG pro­cure­ment projects. Fur­ther­more, the LNG trad­ing busi­ness has grown strong­ly in recent years. More­over, with its sub­sidiary Liqvis, Uniper is active in the field of LNG mobil­i­ty in heavy goods traf­fic. Why MOL as a partner? MOL is a Japan­ese trans­port com­pa­ny found­ed in 1964. Through­out its long­stand­ing his­to­ry, MOL has grown into one of the world’s largest full – line marine trans­port groups. MOL is one of the lead­ing play­ers in the LNG ship­ping indus­try. In 2017, MOL built the world’s largest FSRU: The FSRU Chal­lenger (Turkey) – owned and oper­at­ed by MOL. It rep­re­sents the basis of the design for the FSRU Wil­helmshaven.